Help! Large leaves have invaded my pool, and they are winning! The poor pool sweep is constantly getting clogged-up with leaves, rendering it unable to do its job. Then I have to pull out the vacuum, open it up and take out whatever vegetative matter has incapacitated it. This I have to do just about every day. My neighbors on the right side of my house have several security cameras pointed at my yard & pool. I don’t think they’re looking for burglars; I think they sit & watch the camera footage at night, with a glass of wine, and laugh at me–the crazy woman next door doing battle with the leaves. 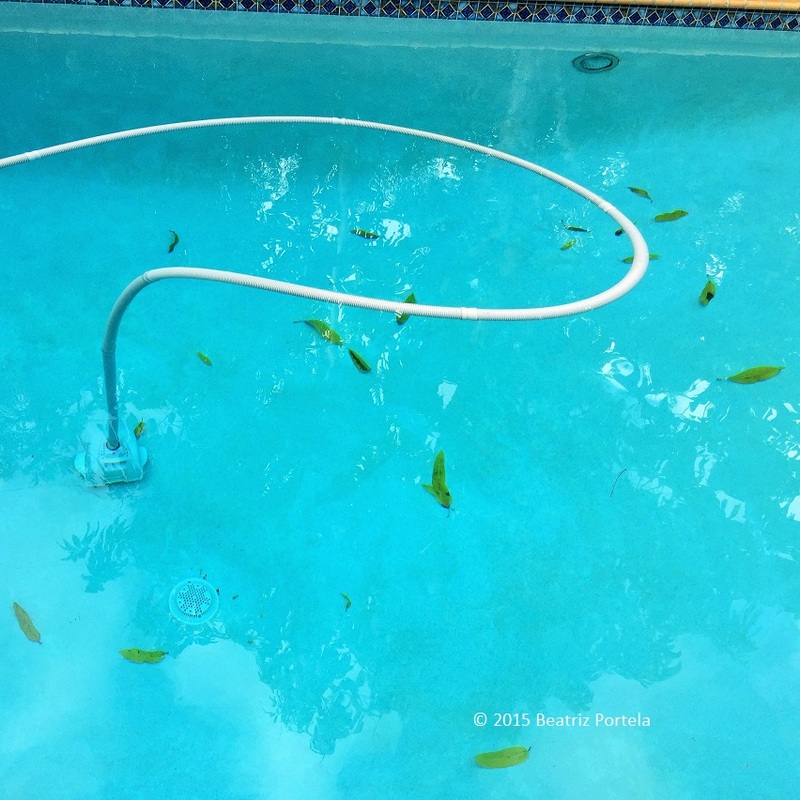 First I go through the ritual of scooping-up the leaves with the pool net attached to the long pole (I had to do physical therapy for my shoulder because of the strain of dragging that net thru the pool but that’s another story). Then I pick up the leaves by hand that have dropped close to the pool edge so they don’t end up IN the pool if a strong wind picks up. Oftentimes I “finish” by hosing off the patio and chasing the last remaining leaves off the patio into the yard with a stream of water. I am water-conservation conscious, of course, and only do this because the water is quenching the thirst of the mango trees, which are bordering the pool. If I punish the trees by withholding water, they’ll probably drop even more leaves. By the time I’ve finished cleaning up & have stored the pool net on the side of the house, more leaves have flown into the pool from the branches of the trees. So sometimes I even pluck yellowed leaves off the branches I can reach before they have a chance to maliciously make it into the pool. I even purchased a leaf blower/vacuum, which I use once a week or so, when I have time. With this cumbersome, noisy machine, I slurp up every last one of the offending leaves from the entire patio & back yard, including the ones hiding in the corners. I used to feel a tremendous satisfaction after vacuuming up all the leaves, but now I don’t. Because I know that by the afternoon, the ground will again be covered with a batch of new leaves. Oh well, at least my neighbors are enjoying the spectacle. Hiya very cool website!! Guuy .. Beautiful ..